It's no secret. 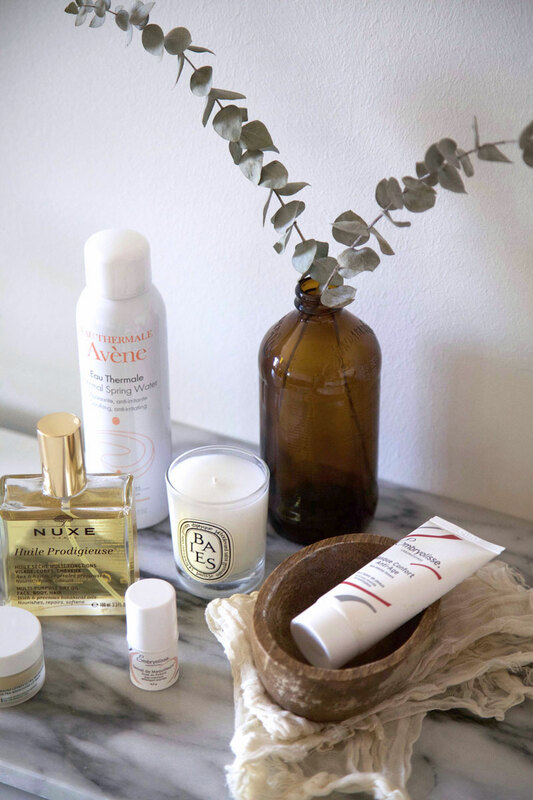 French beauty products are a cult favorite the world over and for good reason. They're high quality. They're well made. They work. I stocked up on at least half a suitcase of products (much to Mr. RC's dismay/horror/shock/amazement) on our last trip to Paris. While I love each of them, and I'll eventually do a post on all of them, I wanted to share the few I've been reaching for over and over again during these hot summer months. Avène Eau Thermale (Thermal Spring Water) || Quite literally spring water from Avène; I know you're wondering why you would spend any amount of money to buy a can of water (because I, myself, wondered the same thing), but trust me, it's totally worth it. This water is reviving, refreshing, cooling and energizing. You can use it any time throughout the day to refresh your face, you can use it before you apply makeup in the morning or as a finishing step after cleansing your face at night. For me, I love to use it to wake my face up in the morning as well as throughout the day to cool down when the temperatures are particularly high. Bioderma Solution Micellaire (Micelle Water) || This is the only product I use to remove my makeup anymore. It's wonderfully light and refreshing so it's, quite literally, a cool way to remove your makeup after a hot day. It's also one of the only products I've ever found that will fully remove my makeup, something that is especially important when it's hot out, as heat + sweat + makeup can equal clogged pores, something that no one wants. To use it, I simply put a little on a cotton pad and gently rub it across my face. I'll use anywhere from 5-8 pads, depending on how much makeup I have on. Nuxe Huile Prodigieuse (Multi-Purpose Dry Oil; also comes in a bronze shimmering version) || This oil has all but replaced my morning moisturizer for the summer. It's super light and gives me a nice dewy, not oily, glow, both alone or under makeup. I simply spritz one or two squirts into my hand, then gently rub it into my face. Afterwards, I run my hands through my hair to deposit any extra through my strands. This oil is amazing for taming fly-aways and giving my hair a little extra shine. Also, it has a lovely light fragrance, as well, so, for evenings out, instead of dabbing on heavy perfume, I'll spritz this on my arms and décolletage, then gently rub it in. Last but not least, I'll sometimes use a small amount on top of my makeup as a highlighter. Nuxe Baume Lèvres Ultra-Nourrissant (Ultra-Nourishing Lip Balm) || Not only does this lip balm smell deliciously like citrus and honey, it's also thick and moisturizing without being sticky and goopy. It's perfect for healing dry, burnt lips after a day in the sun or at the beach. Embryolisse Secret de Maquilleurs Eclat du Regard (Artist Secret Radiant Eye) || This product is highly recommended by many makeup artists throughout the world (hence the name) as a great base for eye makeup. While it is definitely that, it's also super refreshing. Even if I'm not putting on any makeup for the day, I'll put this on for the cooling and depuffing effects that it provides. Like the thermal water, this eye cream also feels really nice to apply in the middle of a particularly hot day. Embryolisse Masque Confort Anti-Age (Anti-Age Comfort Mask) || This mask is made up of ingredients that are, as the label claims, great for anti-aging purposes, but they're also really wonderful for healing and moisturizing dry skin. Per the instructions you can leave the mask on for 10 or 15 minutes before wiping off, or you can leave it on overnight. Because this feels and absorbs more like a cream than a mask, I typically put it on twice a week (Wednesday and Sunday nights) and sleep in it to get the full moisturizing benefits. Bonus- the faint sweet rose smell always helps me slip into dream land faster than on the nights when I don't wear it. Do you have any favorite French beauty products for the summer?